I’m honored and privileged to say that I am the chief engineer of this car. In fact, of the 34 years I’ve been at this company — can it really be that long? — one-third of that time was dedicated to the LFA. This is a car that comes alive. In fact, I describe the LFA’s engine sound as being like the “roar of an angel.” I was told that the poet Alfred Tennyson coined this phrase, which disappointed me when I found out. But it still captures the car’s spirit. There are five entries in the blog so far — The Roar of an Angel, The Purpose of Performance, Trials & Triumphs at Nürburgring, The Motive, The Emotive, and the Extraordinary, & The Wonder of the LFA Works — and all have their share of entertaining and sincere insight. 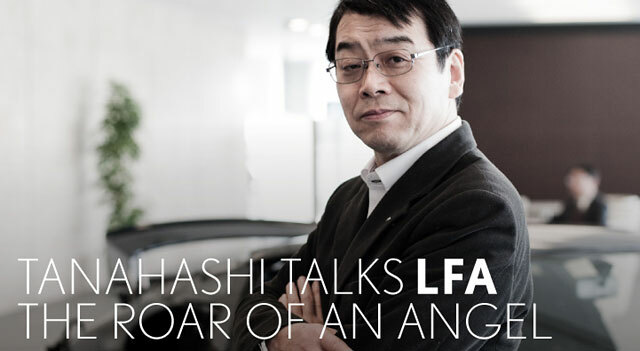 There’s an artistry to the way Tanahashi-san describes the LFA, and I’m looking forward to following along as he shares his experience in creating the very first Lexus supercar. Mitzi Hemstreet: "Angels having orgasms"